We all wake up in the morning, and upon grabbing our toothbrush, we squeeze a pint-size of toothpaste on it. Just what is this and why do we use it? We shall dwell a tiny bit into what toothpaste really is. We have asked our Los Algodones dentists for a bit of hindsight, so we hope this article clears your doubts and curiosity. Toothpaste have an important role to fulfill in our daily lives. They actually help in the task of brushing in several ways. First of all, it is good to make sure that we use a toothpaste with fluoride. Fluoride is a mineral that helps and strengthen our tooth enamel, making it sturdier and healthier. 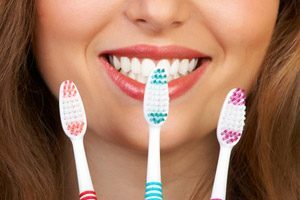 There is also the fact that brushing twice a day helps removing a lot of the particles and food that get stuck in our teeth. This helps keeping our breath fresh and protected from unpleasant smells. The foam in toothpaste helps reaching everywhere and into tiny spaces. It also aids spreading the minty smell throughout the mouth. Toothpaste has many substances and chemicals in it in order to accomplish its job. Some of the most common ones are water, abrasives, fluorides, antibacterial agents, flavor, color, preservatives and humectants. Take in mind that it needs to stay in a paste form, while also giving it shape, color and taste! How much toothpaste should I use when brushing? We get asked this question a lot in Los Algodones, and the answer is quite simple. A pea-size amount is more than enough for our brushing session. More than that will just make us want to get rid of the excess and be done before the 2-minute mark. One of the advantages we have is that depending on the issue we want to tackle, there is probably a toothpaste for it! Whitening toothpastes. These contain abrasives in order to help removing surface stains off your teeth. Since they need to be safe to use at home, the amount they have is very mild and can take some time before you can see any different in shades. Nonetheless, whitening toothpastes are able to achieve results in two to three weeks. Tartar prevention and gum inflammation. These are optimized to deal with the development of tartar and gum inflammation. This is usually done by certain antibacterial agents and chemicals. It is recommended that you look for an ADA seal of approval as it is common to falsely proclaim this. Tooth sensitivity. When our tooth enamel wears down, it is easier for changes in temperature to reach into our teeth. 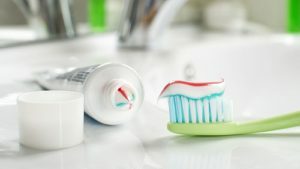 In order to avoid this, some toothpastes block the tiny, microscopic holes that lead into our teeth by using strontium chloride or potassium nitrate. Fluoride is also a common way to deal with this. Easier time cleaning and brushing your teeth. Helps strengthening your tooth enamel. Prevents cavities and tooth decay. Keeps your teeth clean and without stains. Together with flossing and a good mouthwash it helps achieve a good line of defense. No Replies to "Toothpaste: Its Importance In Our Lives"